Jimmy Barnes has been there and back. He’s tasted glory as the most successful Australian rock & roll singer. He’s also struggled with the pressures of being a tall poppy and he’s wrestled his own demons. It’s been a wild ride. As lead singer for Cold Chisel, he fronted Australia’s (arguably) most successful rock band. Within a month of Cold Chisel finishing, Jimmy Barnes was on the road with a new band (1984) and soon released his first solo album, Bodyswerve, and it entered the charts at #1. The next year he recorded 1987’s Freight Train Heart – another #1 debut. Around this time, to celebrate the massive tour ‘Australian Made’, Jimmy and INXS recorded an Easybeats song “Good Times.” The single topped the Australian charts and subsequently was a Top 40 hit in the US and a Top 10 hit in the UK. Two Fires – released in 1990 and yet another #1 album was Jimmy’s most sophisticated set yet. And Later that year, on little more than a whim, Jimmy and Producer Don Gehman cut an album of soul classics – The Soul Deep album was a massive success with sales to date close to a million copies. Jimmy’s next album, ‘Heat’, was his toughest yet. Straight up, hard rock with a nod to funk. The album was also a success -that same year Jimmy put together the ‘Flesh and Wood’ project that featured acoustic duets and collaborations. Jimmy took part in the 1998 reformation of Cold Chisel. Getting together wasn’t just a matter of recording some tunes and playing some shows, it was also a reconciliation; since there have been other tours and shows and the possibility of further adventures remains. In 2002, Jimmy began the hard road to sobriety. Double Happiness was released in July 2005 and debuted at #1 in the ARIA charts. His 15th number one album, but the first in almost a decade. With a string of radio hits across different formats, ‘Double Happiness’ sold double platinum. It even led to a karaoke featuring songs from the albums plus Jimmy’s hits accompanied by some hysterical videos. It was the beginning of a new era. In October 2005, Jimmy Barnes was inducted into he ARIA Hall of Fame in his own right (Cold Chisel had already been inducted in 1993). To celebrate his 50th birthday, his label, Liberation Music compiled a boxed set of Jimmy Barnes’ solo work plus studio and live rarities into a lavish package, entitled ’50’. Early in 2007, Jimmy underwent open-heart surgery to repair a congenital heart defect. The recovery from the surgery necessitated several months of bed rest. It was during this time that Jimmy began writing for his platinum selling 14th solo album, Out In The Blue. 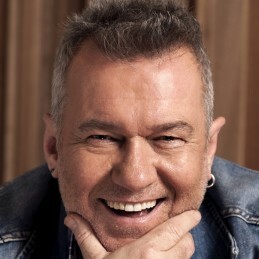 In 2009 came the Platinum selling album prequel to Soul Deep, The Rhythm and The Blues, and with this Jimmy Barnes racked up his ninth #1 solo album. 2010 will see the release of Jimmy’s 16th solo album – a rock record again produced by Don Gehman with the working title ‘Rage And Ruin’.